The personal papers of former United Nations Ambassador Irving Salomon, who lived much of his life as a diplomat, rancher and philanthropist in Valley Center, were donated by his family to the Valley Center Historical Society which established the Salomon Archive. Hundreds of documents, letters, photographs, and memorabilia are housed in a permanent archive at the Valley Center History Museum, and are available for access by historians, scholars and researchers. Col. Salomon and his family had collected documents spanning some 75 years. Most of the material had been in the care of his daughter, Abbe Wolfsheimer Stutz, who grew up at the family ranch in Valley Center. Col. Salomon retired in 1945 after a successful career as a Midwestern industrialist, and moved to Valley Center where he bought a 2,300-acre ranch, and began a new life as a rancher raising prize-winning Herefords, Hampshires and quarter horses. It was as a diplomat, however, that Col. Salomon earned an international reputation. He accepted an appointment from President Eisenhower to become a member of the U.S. Delegation to the United Nations where he held rank as Ambassador. He served the U.N. in a host of other capacities and, at one time, was given the rank of Under-Secretary. 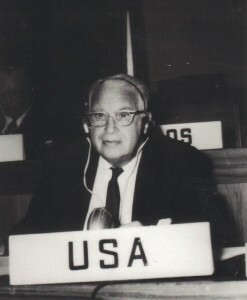 Until shortly before his death in 1979 at age 81, he had traveled worldwide as a United Nations representative and as a U.S. State Department emissary on worldwide missions. During his tenure with the U.N., Col. Salomon worked with dozens of world-class leaders and often invited them to visit his Valley Center ranch. First Lady Eleanor Roosevelt and President Eisenhower were among many who were hosted by Salomon and his wife Cecile. Motion picture celebrities would often join the family at their home. Widely respected as a humanitarian and philanthropist, Pope Paul VI honored Col. Salomon in 1972 for distinguished and notable achievements. It marked the first time that a Pope has conferred Knighthood on a layman of the Jewish faith.